All it takes is a slip of the fingers to accidentally transpose a few letters, and voila, you’ve got yourself into a situation involving an egregious spelling error. You might think the featured picture is a little bit too dramatic for this topic... well... it is no lie that this add on literally makes me feel like this girl pictured !! Every time the tool corrects my spelling of definitely I sing a little song of joy (can never get my head round that word!!). I'm sure you have words you misspell all of the time as well. Then there’s the dreaded grammatical debate. Some people follow the rules of Strunk and White and read ‘The Elements of Style’ every night before going to bed. Others believe that the internet has changed the rules of grammar forever. Neither school of thought is completely right, but both undoubtedly make grammar errors that can be avoided. You don’t need to have perfect grammar or be an expert in spelling to improve the quality of your writing. Have you ever been reading a blog post, an article, or even a book and run across a spelling error that changed the context and concept of message completely? Accidentally type ‘massage’ instead of ‘message’ and - well - you see what I mean. If you write something that is grammatically incorrect, you can also inadvertently change the meaning of the sentence, leaving readers very confused. Even with auto correct you can make spelling errors if you go too quickly and fail to proofread your words. Typing out the word ‘that’ instead of ‘than’ may make a sentence unclear and clunky. If you’re talking about ‘typos’ and you write down ‘types’ instead, you’ll also cause your audience to miss the point. Spelling mistakes aren’t always errors, meaning that a word can be spelled correctly, but you accidentally typed out a closely related but misspelled word. Grammar mistakes are even more common than spelling errors. From comma splices to subject-verb agreement, if your sentences aren’t typed out tightly and concisely there is likely a grammatical error present. Do you know how to use semicolons in the correct manner? When you’re typing a piece that needs to adhere to Chicago style or MLA format, how do you know if you’ve followed all of the rules? Grammarly is both a software and add-on that writers can use to check over their work for spelling and grammatical errors. In addition, Grammarly can actually make suggestions that will make your writing clearer and more succinct. If you have ever struggled to get your point across while writing a research paper or a scholarly article, Grammarly is a tool that you need to have in your arsenal. Grammarly is a program that you can use in conjunction with word processing software, your blog, and even on the web to ensure that your writing is always on the mark. ​It’s a standalone tool that you can use to manually check your writing, and it is also an add-on extension that works with dozens of existing pieces of software. How you use Grammarly depends on whether you’re a professional business owner, a student, or a budding master of words. ​Just download the Grammarly extension for your preferred web browser and you will be able to ensure that all of your blog posts are grammatical error free. As you type out new blog posts Grammarly will highlight all potential spelling and grammar errors, enabling you to make changes before you hit the publish button. 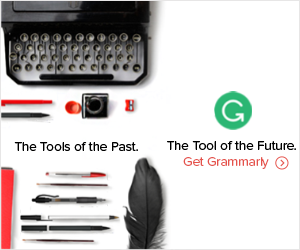 Grammarly has been the secret tool of professional and novice bloggers alike for years. While you should always read over your writing to see if you missed any spelling or grammar errors, using tools like Grammarly will make your writing more precise. Make sure that all of your published works are polished and finely tuned. Grammarly can improve your writing as well as make spelling errors a thing of the past. "I use the Google Chrome extension of Grammarly. Right now as I'm typing this Grammarly is behind the scenes checking every word and sentence that I typed out so I don't look bad. There was a case study done on spelling errors. Charles Duncombe, CEO of a $20 million-per-year online retail group, wondered why his online hosiery site was underperforming. He discovered a spelling mistake in a prominent line on a product page, where the word ‘Tights’ was spelt ‘Tihgts’. When the mistake was fixed conversion rates jumped 80%." We use Grammarly to avoid making mistakes in emails and product descriptions. We would lose credibility if people were noticing spelling and grammar mistakes in our writing. I feel like it reduces my mistakes by about 80%, and the remaining 20% are probably when I forget to check the suggestions. Wallsauce.com is an e-retailer so digital marketing is at the forefront of its strategy. The Grammarly plug-in enables me to quality control blog posts in Word, statuses created directly on social media before they’re posted and emails sent from Outlook. It gives me a great deal of confidence in my work and as one of the brand representatives of Wallsauce.com! As usual let us know in the comments below! Have you used Grammarly before or are you going to use it now? Has this tool helped improve your writing?